Watch videos for all the features of the aMemoryJog web edition. Learn how to track passwords and more, import and export data, generate passwords, launch websites, copy and paste userid and passwords, and how to use it in your native language. 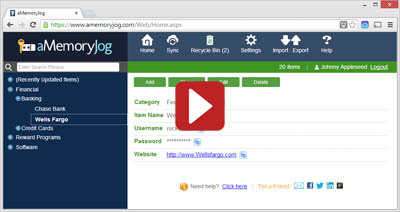 This quick video shows you the basics of using the aMemoryJog web edition. It shows you how to use the home screen, categorize entries, and set your desired language and other settings. This video a more in-depth view of using aMemoryJog. It shows you how to create a free account, add and categorize entries using the home screen, import and export data, and change your desired language and other settings. 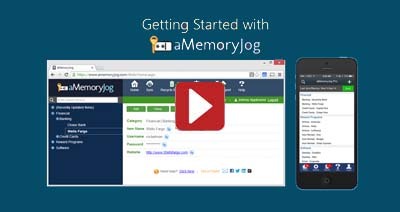 This video shows how to use the main page within aMemoryJog where you will categorize, add, edit and remove items. It also demonstrates how to set your desired language and other settings. This video demonstrates how to import and export data using aMemoryJog. This video demonstrates how to restore deleted items from the Recycle Bin. This video illustrates how to set the desired language and other settings within aMemoryJog.